RCC (Reinforced Cement Concrete) column belongs to an inherent structural element of RCC frame structured building. It refers to vertical member that disperse loads from slab and beam directly to the soil underneath. The entire building rests on columns. Most of the building failure happens because of the column failure. Both design error and the substandard construction practice are liable for column failure. So, there should be clear conception on the construction process of the RCC column. 4. Pouring concrete into column. 1. Column layout work: Under this stage, the location of columns is practically arranged in the jobsite. It is done by placing rope compliant with the grids presented in the drawing and then mark the position of the columns related to the rope. In drawing, column locations are demonstrated according to grid-line with dimension. In construction field, the ropes are taken as grid-line. So, the columns should be placed to rope-line by calculating the dimension given in the drawing. 2. Column Reinforcement work: Once the positions of the column are marked, the reinforcement is placed with reference to the structural drawing. C1-12#16 mm⌀ and stirrup-10 mm⌀ @ 4″ c/c. It indicates that column C1 will contain 12 numbers of 16 mm diameter bar as vertical bar and 10 mm diameter steel should be placed 4 inch center to center as stirrup. C2-8#20 mm⌀ + 10#16 mm⌀ and stirrup-10 mm⌀ @ (4″+6“) c/c. 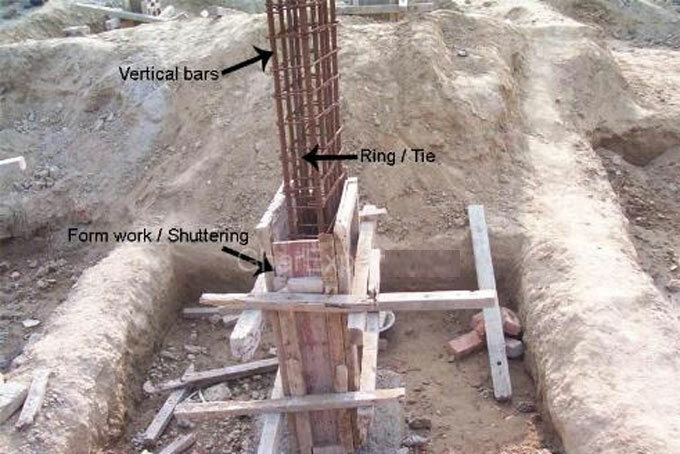 This C2 column’s reinforcement specification signifies that it’ll include 8 numbers of 20 mm diameter bar together with 10 numbers of 16 mm diameter bar as vertical reinforcement and (4″+6″) center to center of stirrups placement signifies that the middle-half portion of clear height of column will contain 6″ center to center spacing of stirrups and upper one-fourth and bottom one-fourth height of column’s clear height will retain stirrups at 4″ center to center spacing. A sheet exists in structural drawing that comprises of structural notes from structural designer. In that drawing sheet, you’ll get suggested lap length for column’s steel of various diameter bar and other vital notes. One should understand those prior to column reinforcement work. 3. Column formwork: In building, floor height generally remains 10 feet. If there is beam in slab then we have to pour concrete up to beam bottom level. Assume that the height of beam in drawing is given as 1′-6″. Therefore, the casting height of the column should be 8′-6″. And the height of formwork will be 8′-6″. It should be remembered here that dropping concrete from over 5′ height isn’t recommended throughout pouring. Since it leads to concrete segregation, it is required to create one-side of column formwork within 5 feet height range. Once, 5 feet of column is cast, the short side should be lifted up to full-casting height of column next day. Another way to cast column devoid of segregation is to maintain a small window at 5 feet level of full-height formwork. Once casting is completed up to that level, close the window and cast the remaining portion of the column. 4. Pouring concrete into column: The process is simple for casting column. For small quantity of concrete volume, machine-mix concrete is suitable and for large concrete quantity, ready-mix concrete will be preferred. If moving pump is used with ready-mix concrete and if it is required not to exceed 5 feet height range for dropping concrete that will be complicated. If moving pump is not used, there will be some issues. Assume, it is necessary to utilize ready-mix concrete excluding pump. Under this situation, the concrete should be unloaded by hand on job site from ready-mix concrete truck and poured into column manually. It will consume long time and initial setting time of concrete will be exceeded. Because of this, concrete will lose its quality. Therefore, it is suggested to cast column with machine-mix concrete.